“What cha doin’ Grandma?” Jet asked as I pulled a basket from the closet. “Well, okay, if you’re very careful. We don’t want to hurt her. Remember she has a sore leg.” I gave her a wide-toothed rake. 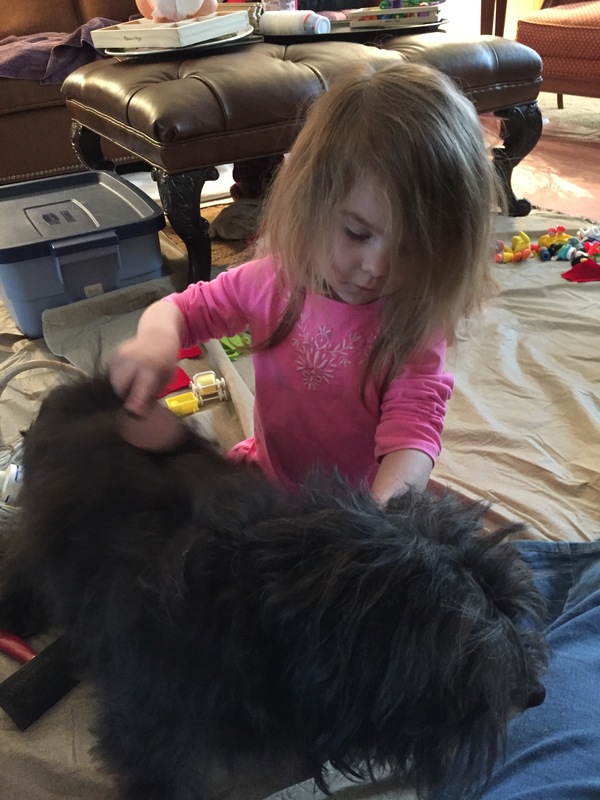 “If you find a tangle, don’t pull her hair.” We began the process of brushing Marcy’s long black fur. Jet has been brushing her own hair lately, so she has a good idea of how it feels to pull a tangle too hard. “Here’s another brush like yours Grandma!” Jet pulled a second slicker brush from the basket. “It’s not a toy,” she agreed solemnly. “I only have little bit of hair on my arms. Just a little bit.” Jet pushed up her sleeve and rubbed her hand over her arm. “You can’t see it. It’s just a little bit of hair. It’s right there.” She rubbed her forearm more vigorously.